Kokolo, although ardent worshippers at Fela Kuti’s afrobeat altar, inject elements from their New York surroundings into More Consideration. 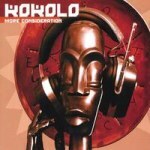 The cover for Kokolo's follow up to 2002's Fuss or Fight features a rather animated looking African wooden figure, eyes sublimely shut, donning a gigantic pair of headphones. Judging from the tunes emanating from this disc, sublime guy is obviously lost in the explosive rhythm of afrobeat. The venerated iconoclast Fela Kuti created the genre, a throbbing mixture of West African highlife, American funk, and jazz complemented by often scathing political lyrics, in Nigeria in the late 1960s. Many stateside groups have picked up the afrobeat torch since his passing. One of them -- not named Antibalas -- is Kokolo, a New York based band formed in 2001. The name, according to their website, comes from slang used to peg devotees of African-derived music in Spanish-Harlem. You might ask, what is a New York based group doing making songs about the political situation in Nigeria? Well, they aren't. Kokolo undoubtedly pay respect to the late Nigerian master (as evidenced on the vocal intro to "Mama Don’t Want No Gun": "Respect to the man / Who holds his place in time"), but Ray Lugo's hip-hop inflected vocals and unabashed sprinklings of salsa take the genre in a new direction. This album, which features the core members of the band along with a host of special guests -- including Jojo Kuo, former drummer in Fela Kuti’s Egypt 80 band -- combines a host of musical stylings. "Everybody (Trying to Get Buy)" starts off with a riff that invokes James Brown, the Godfather of Soul, then morphs into an extended, pulsating, horn-driven jam sure to cause people to get on the dance floor and burn the soles of their feet. On "Root to the Fruit”, rapid-fire Spanish lyrics drive the song into a frenetic pace, and the horns and backing Yoruba-sounding vocals leave you wondering, where exactly am I -- in Nigeria, or some Spanish-speaking island in the Caribbean? The groove is so tight, you don't really care. However, it's safe to assume that you're somewhere in between, because Kokolo's music traverses the rapidly disappearing boundaries between disparate cultures and styles with ease. The explicit politics surface on "Democrazy", where Ray Lugo wryly comments on the paradoxical nature of forcing democracy on people all over the world: "Cause what we're trying to do y'all / Is market it / And package it / And baggin' it / And sellin' it / And forcin' it all over the world / Cowboy boots and all". In the wake of the invasion of Iraq, the only obvious lyric that seems to be missing is, "Are you listening President Bush?" While Lugo's sometimes clunky raps either cause one to raise the "did he just say that?" eyebrow ("The world is sick like a child molester / It’s big like Lurch but it looks like Fester"), or often don't hit as hard as the vocal stylings of traditional afrobeat, this is a record full of funky songs in which the horn section is tight and the backing vocals are flawless. The mix of cross-genre influences will make this record appeal to lovers of funk, jazz, and Latin music alike. Although Kokolo is one of the newer groups on the scene, they have honed and polished their skills through touring abroad over the past few years. The bottom line is that this band wants you to dance until you can't dance anymore.